Set out paper, black markers, and mirror. When working with six- to nine-year-old children, include pencils and erasers. Explain to the children that when an artist makes a picture of a person it is called a portrait. When the artist makes a picture of himself or herself it is called a self-portrait. 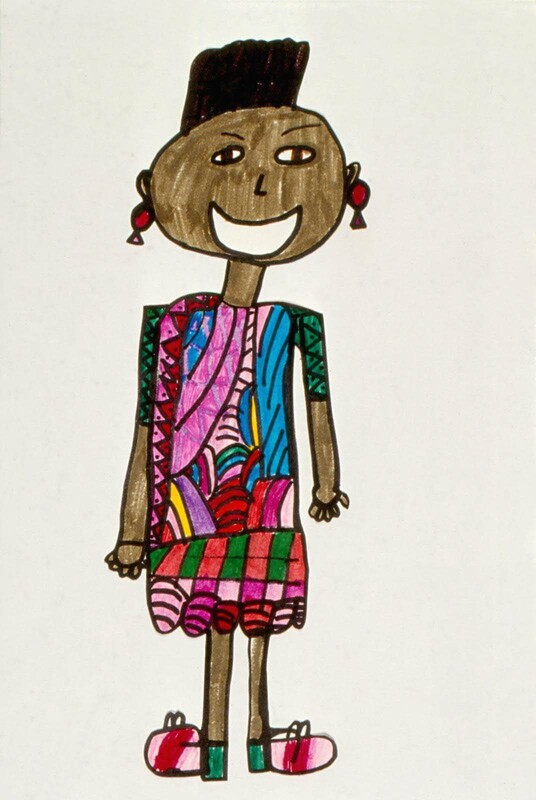 Tell the children that they will be drawing pictures of themselves from their heads to their toes and adding color to their self-portraits in the next session. Ask the children to stand and do some simple exercises to become familiar with their body proportions, or the relationship of their individual parts to their bodies. Begin by having the children rotate their heads in one direction and then the other so they become more aware of their necks. Explain that the neck is sturdy and almost as wide as the head. They can feel this by sliding their hands along the side of their head down to their necks. Next, have the children move their hands from the sides of their heads toward their shoulders to feel how their shoulders extend outward, being wider than their heads. Ask the children to stretch their arms as far as they can above their heads to feel how long their arms are. Dropping their arms to their sides, have the children press their elbows against their body. Ask where they feel their elbows touching. They will be surprised that their elbows come down to their waist. With their arms still against their bodies, ask them to gently pinch themselves. After many cries of "ouch," they will realize that their arms with extended hands reach to their mid-thighs. With their arms hanging loosely, have the children wiggle and roll their shoulders. Discuss how their arms are also moving because they are attached to the shoulders. By touching their toes, the children can appreciate that their legs are almost half of the length of their bodies. Point out that the hips are located at the mid-point, or middle, of the body which means that the distance from the top of the head to the hips is about the same length as from the hips to the bottom of the feet. Finally, stretch out a leg to appreciate how long it is and discuss what it would be like walking on sticks or on feet too small for balance. Invite the children to observe themselves in the mirror, looking for unique characteristics, such as glasses, hair types, and freckles. Be sure the children understand to use their paper vertically and make their figures large enough to fill the paper. 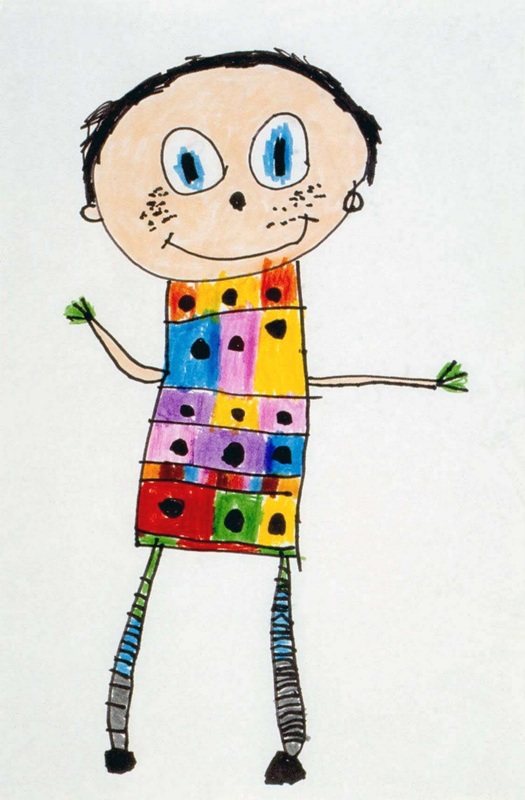 Children ages three to six should draw their self-portraits with the black markers. 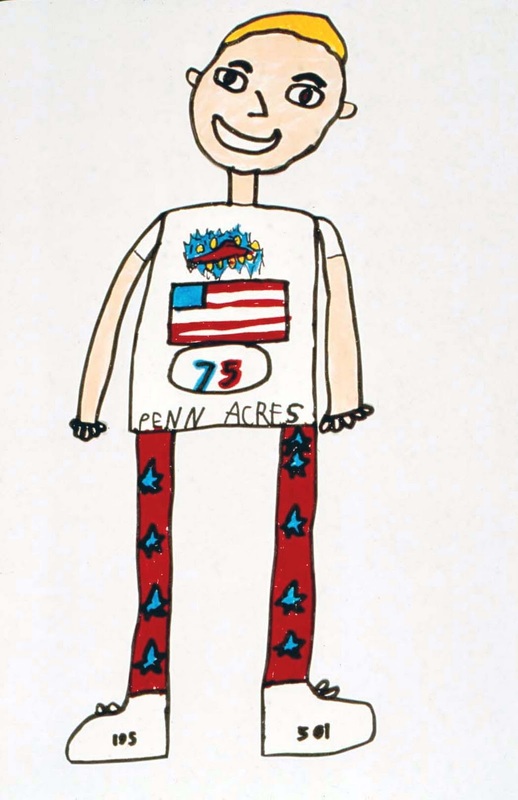 Children ages six to nine do well using pencil to get their head shapes in proportion to the paper size. They can then go over the penciled head shapes with black markers and continue the rest of their drawings with the black markers. Have the children draw their self-portraits. 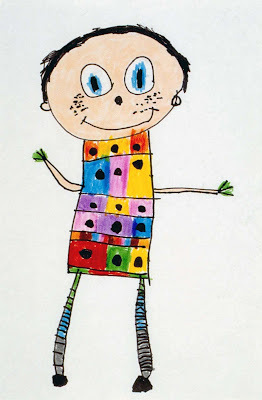 Encourage them to include lots of details in their clothing, such as buttons, pockets, patterns, zippers, and shoelaces. Remind the children not to color in with the black marker, because colored markers will be available in the next session. Set out drawings, black permanent markers, and watercolor markers including skin tones. 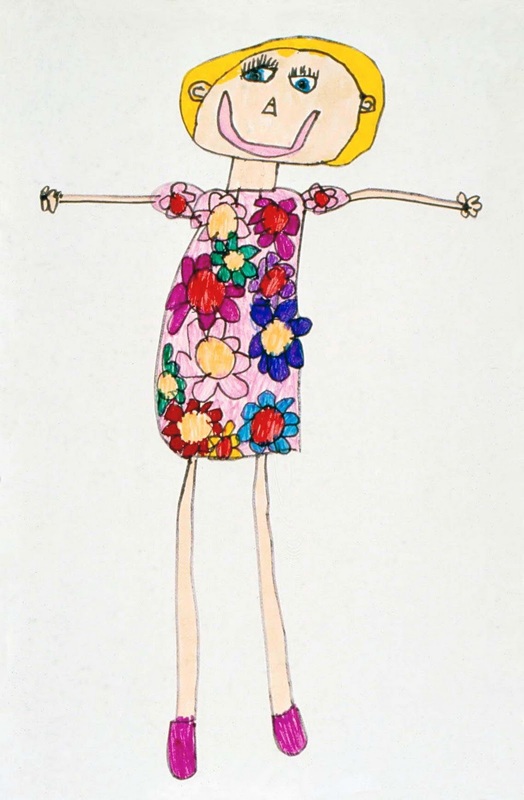 In this session the children will be adding color to their self-portraits with watercolor markers. 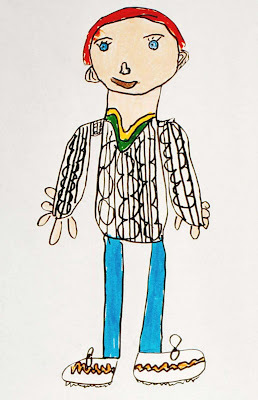 Remind the children that these are self-portraits and should include their own hair color, eye color, etc. 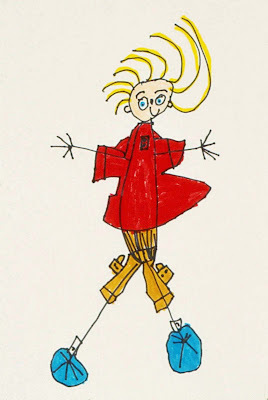 Have the children complete their self-portraits, referring to the mirror whenever necessary. Encourage the children to include lots of details. Three- to six-year-old children need only a few general guidelines. They will probably still forget to draw their necks and will make their arms extend from their waists. This is natural. With practice and age, they will gradually catch on. 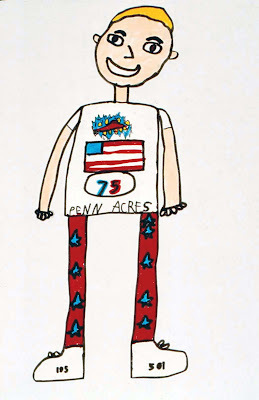 Six- to nine-year-old children appreciate extra points of measurement, such as the relationship of the number of head-lengths to their total body length, which changes as the children get older. For example five- to eight-year-old children are generally five to six head-lengths, while nine- to twelve-year-old children are six to seven head-lengths. Once you have made the children aware of their body parts and proportions, it's important to let them draw freely without having them make actual measurements. Drawing with pencils usually produces figures that are too small to add much detail and the children tend to spend too much time erasing their work. However, older children will appreciate using pencils to get their head shapes in proportion to the paper size. Too small or too big can be easily erased and tried again. When the head shapes are suitable, the children can go over the pencil line with their black markers and then continue the rest of the drawing with the black markers. Because they are eager to start adding color, some children will want to stop drawing too soon, leaving out wonderful details. Do this project in two sessions, saving the colored markers for the second session. The lighter, brighter colors of markers make a nice contrast to the black lines of the drawing. Put aside the darkest colors which tend to cover over the black marker, often losing lots of charming detail. Do the self portraits fill the papers? Discuss the proportions used in the drawings. 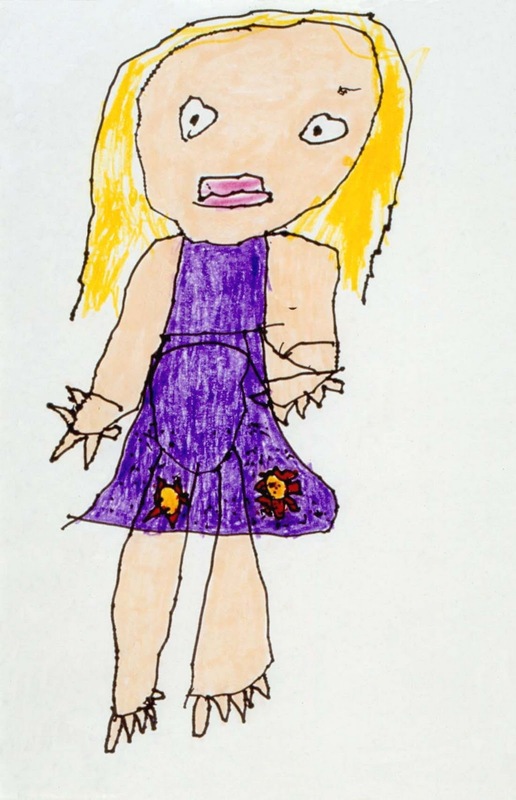 Ask the children to identify the person in each portrait. Discuss which aspects of the drawings help us to identify the person. I drew my head too big and there’s no room left on this paper for my body and legs. I have a favorite t-shirt. Can I draw that instead? None of these skin colors matches mine. What color can I make my lips? I don’t want to look like I have lipstick on! I need navy blue for my jeans. Remember that your hips are the mid-point of your body. On the top half of your paper, your will need to include your head, shoulders, and stomach. If you made your head too big or too small, you can erase it and try again. You don’t have to draw what you are wearing today, but remember to include lots of details in your clothing. The color of marker that is closest to your skin color will work well. Look carefully at your lips. Consider using orange, pink, or tan instead of red. The darkest colors of markers will cover up the pockets and zipper you have already drawn in your jeans, so if possible, use a lighter shade. You as the artist can choose the color to use.